Leroy Street’s The Goat, Or Who is Sylvia? There’s only one more week to see The Goat, or Who is Sylvia? playing at Unit 102 Theatre, and see it you should. Leroy Street Theatre’s production is a stunning example of the excellent indie theatre scene currently flourishing in Toronto. Directed by Christ Bretecher, this staging of Edward Albee’s play about a man who falls in love with a goat is poignant, intense, and at times hilarious in its sharp wit and absurdity. 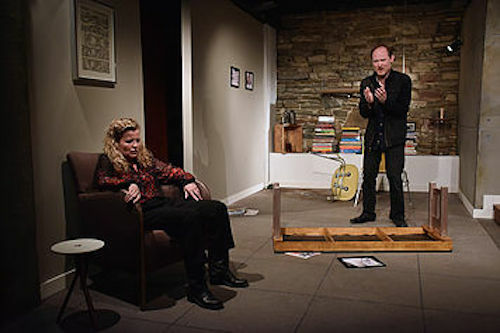 Set in the living room of Martin and Stevie, a couple that has a surprisingly strong marriage even after two decades together, the play starts by depicting their easy rapport and intimacy, and then, later, the crumbling of not only the current state of their marriage, but also the ways in which this particular affair retrospectively reframes the meaning of their entire relationship. The acting is mostly strong across the board, though Paul Rivers (Martin) seems a bit stiff for a character who finds himself in love with a goat. While Martin is weirdly self-assured about his feelings for Sylvia (the goat), he seems sort of spaced out. I found myself wanting more emotional nuance from him, especially since he’s at the centre of the conflict. Joel Fishbane is strong as Martin’s oldest friend, providing an initial friendly dynamic which shifts to horror and disgust when Martin confides in him. Stephen Macdonald is excellent as the couple’s gay teenage son, and creates quite a presence despite not having as much stage time as everyone else. Most notable, however, is Shauna Black, who plays Stevie: every single line she utters is perfect in its emotional tone and resonance. This is deeply impressive since her character has the most intense emotional journey in the show, and we see her move through a huge range of feelings and reactions from shock to rage to deep sadness and indignation. And yet through all of that she also conveys the underlying love that has grown from two decades of marriage, love that cannot be as easily undone as her ego. The programme describes the play as a modern tragedy, which is apt. Taking fate out of the equation, each character is faced with a situation in which they can only proceed in one direction, and yet that choice contributes to an impossible tension that culminates in a kind of social fracturing that has no obvious or even not-so-obvious solution. The characters are laid bare, left to reckon with the dark underbelly of humanity for which they entirely unprepared. This play and the grace of this particular production depicts a gulf between human nature and social conventions that raises many questions and gives no answers. And, because of that, provides us with a beautiful catharsis.